Today, we are pleased to welcome back guest author Derek Maxfield. 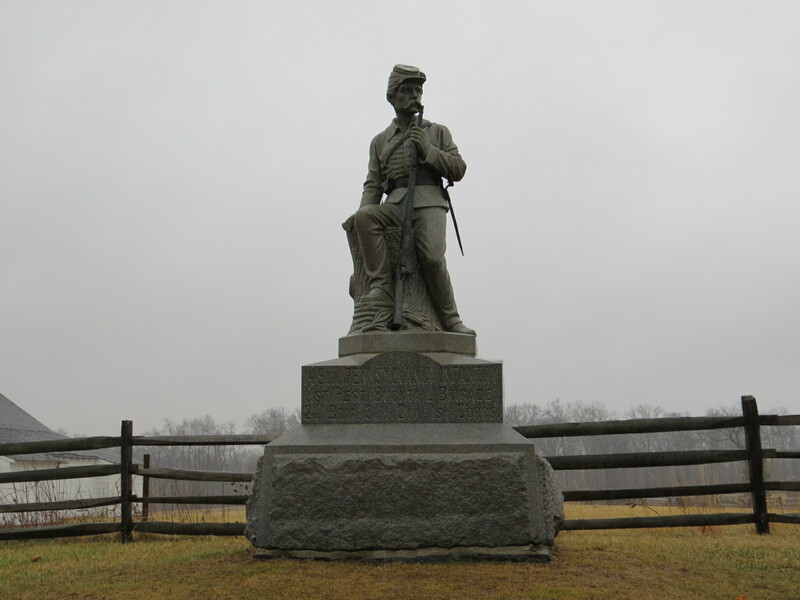 The 149th Pennsylvania Monument at Gettysburg. I have been to the Civil War battlefield at Gettysburg many times. It has always been a special place, but it took on new meaning for me when I discovered that I had an ancestor that fought and shed blood there. I will never forget the moment I discovered the fact. “Holy cow!” I thought. I had been on that field for all these years and never knew! The 149th Pennsylvania Infantry on the Pennsylvania Monument at Gettysburg. One of the few battlefields in the north, Gettysburg was the site of a horrific three day battle, July 1-3, 1863, in which the Union army scored a vital victory over the seemingly unconquerable Robert E. Lee and the Confederate Army of Northern Virginia. There was a ghastly amount of blood spilled at Gettysburg. As Lincoln pointed out so eloquently, “we cannot dedicate, we cannot consecrate, we cannot hallow this ground. The brave men, living and dead, who struggled here, have consecrated it, far above our poor power to add or detract.” In the fury of those three days over 50,000 Americans – north and south – became casualties. According to the National Parks Service, that is more than the Revolutionary War, War of 1812, and Mexican War combined. In the summer of 2009, while working on family genealogy, I discovered that my third great grandfather, William B. Reese, fought in the Civil War. That moment of discovery (once verified; you can’t take the historian out of me) was breath-taking. I learned that he fought in Co. A of the 149th PA Infantry – the so-called “Second Bucktails,” that he fought –and was wounded – at Gettysburg, among other places, and his name was on the big Pennsylvania monument on the Gettysburg Battlefield. The Battle of Gettysburg resulted from Gen. Robert E. Lee’s desire to take the war into the north as a way of freeing Virginia from the devastation of war, at least temporarily, and to try to relieve pressure of Vicksburg, MS – then under siege by Union Gen. Ulysses S. Grant. An invasion deep into Union territory might force Grant, or some part of his force, to be recalled to meet the emergency. Lee’s plan for the invasion went awry from the start. His plan depended upon getting a substantial jump on the Army of the Potomac as he raced north. It was his hope that when his invasion was discovered, the Union army would be forced into long, exhausting marches that would lead to much straggling and wear out the troops. The Union army would be strung out in a long line and vulnerable. He would then hit the northern troops on open ground, crushing the lead regiments and cause panic. Like a row of dominoes the Union army would collapse back on itself. Lee did not get the jump on the Union army as he hoped, and worse, he had no clue that the Union army was on to him and marching to meet him until it was almost too late. His army – not the Union army – was strung out, when he learned of the movement of the northern army. Concentrating his army, Lee came upon Union cavalry at Gettysburg, PA and stumbled into a fight he did not want just yet. In 1863 the Bucktails were assigned to the Army of the Potomac, 1st Army Corps – under Gen. John Reynolds – a Pennsylvania native, 3rd Division, 2nd Brigade. Reynolds and his infantry raced to Gettysburg to help relieve Gen. Buford’s cavalry, as they tried to hold off the Army of Northern Virginia. When they arrived at the front, the 149th was placed among a cluster of cherry trees along an old farm road, near the Chambersburg Pike, facing west. Company K was then deployed out front as skirmishers. About 1:00 PM, the position came under fire from Confederate Gen. Richard Ewell’s 1st Corps to the north, which had established a battery to soften up the Union position. Shells began to drop all around, producing the first casualties the 149th had suffered in combat. While men were being killed and maimed all around, Col. Roy Stone, commanding the 149th, ordered a new front, pulling the Bucktails around to the Chambersburg Pike and facing them north. Between the Confederate positions on high ground more than a mile to their front, and the Bucktails on the Chambersburg Pike, laid a railroad cut that seemed at first glance a ready-made fortification from which to defend against a Confederate assault. Accordingly, the 149th was ordered to seize the cut. This was harder than it looked. The Bucktails rushed over open ground, a hay field which offered no cover. Under fire the entire time, they covered the ground quickly before disappearing over the lip of the cut. The bank of the cut was steep and hard to get a grip on. Rushing as they were, some men tumbled down the cut losing their rifles in the process. Others slid down on their backsides like kids down a slide on the playground. Once down, the Bucktails struggled to climb the north back of the cut and find footing from which they could fire from, peeking their heads up to check on the position of the enemy. Watching the Rebs to their front, the 149th was caught off guard when a battery to the west began to take them under fire, making their positions in the cut untenable. They wasted no time in reversing course and scrambling to the rear back up the embankment they had entered from. By this time the Confederate infantry had spotted the opportunity to assail the Bucktails on the retreat. Advancing to the north lip of the cut, they cut down the Bucktails at will as they tried desperately to get out of the cut. Others saw the futility of the position and surrendered. Running a gauntlet of fire back over the hay field, the Bucktails retreated to their positions along the Chambersburg Pike. Losses had been heavy, especially among officers. Lt. Col. Walton Dwight, second-in-command, was also wounded and took the repulse from the cut quite personally. It was not long before he convinced Col. Stone to let them try their luck again with more support. For the second advance on the cut, the 150th would be on the left of the Bucktails, lengthening the line. The second charge on the cut successfully pushed back the Confederate line, but at a cruel cost. Col. Dwight led the charge, despite the ugly wound “had to use his sword as cane” (Matthews 91). But the gain was little as the Bucktails remained under fire from Confederate batteries and regarded the railroad cut as a death trap. Not long after they retreated back to safer ground along the pike, battered and broken. They had lost the colors, much to their humiliation, and all of their staff officers were wounded. A nose count of those present brought home the sad result of this days fight – less than 150 unhurt out of a possible 450. Around 3:00 PM, a full scale Confederate assault began from both the west and north. A general Union retreat began under good order, but some units ran pell-mell through the town losing coordination. The 149th finally began to collect on Cemetery Ridge, where they found shelter behind the 11th Corps. On July 2nd, the remnants of the Bucktails – now the size of a company – were used as skirmishers along the Emmitsburg Road, just north of Confederate Gen. Longstreet’s ferocious attack on Little Round Top and the Devil’s Den. After taking more casualties, though they were lightly engaged, the 149th pulled back to the main Union line as night fell. All that night the Bucktails retrieved water from a nearby farm and ministered to the thirst of their wounded comrades left on the field. The third day of battle at Gettysburg found the Bucktails posted on “Cemetery Ridge a few hundred yards southeast of the clump of trees which would be the focus of the Confederate assault on that afternoon” (Matthews 98-99). Pickett’s Charge was broken up on the Union center, decisively. Although Gen. Longstreet had pleaded with Gen. Lee to abandon the idea, as he said it was destined to fail, Lee was convinced the Union center could be pierced. The defeat, not only on the third day, but in the battle in general, came as a shock to Lee’s Army of Northern Virginia, which quietly began preparations to retreat back to Virginia. The 149th PA Infantry was not called on July 3rd to help repulse the Confederate charge. As it turned out, they could enjoy a ring- side seat as the action developed to their front. They no doubt took pride in the Union repulse of the stolid Lee and his storied army, but must have reflected on the price paid in blood for the victory. Private William B. Reese received his wound sometime before the Federals retreated back through the town, probably as the first shells fell among them under the cherry trees. Exactly where he was hit is a matter of some confusion. According to the company muster roll, Reese took a “gun shot in the right knee joint… [at] the hands of the enemy.” The regimental history, by Richard E. Matthews (1994), however, says that Reese was wounded in the neck. In any case, he did not return to duty until the spring of 1864. He was transferred to Co. K, 1st regiment, Veterans Reserve Corps. Given the devastation to the regiment on the first days fight – they began with 450 men and mustered less than 150 at the end of the day – it is quite possible that there were mix-ups in the paperwork. Formerly the “Invalid Corps,” the Veterans Reserve Corps was created for the thousands of disabled or partially-abled soldiers that could still be of use to his country. Soldiers assigned to this organization were given light duty, like guard duty or helping in the hospitals. This freed up able-bodied soldiers for combat. In Reese’s case, it appears that he was send to Elmira, NY to wait out the war before being mustered out in July 14th, 1865. Being posted to Elmira was undoubtedly a welcome development for Pvt. Reese, as his home in Charleston, Tioga County, PA was less than 50 miles away. There he was assigned to the Elmira POW Camp. They patrolled the town, inside and outside the palisade, and were posted at various buildings inside the camp. Duty in Elmira was unglamorous, but at least they were no longer where bullets were flying. Like so many others, Reese would go home from the war a broken man. Just over twenty and he was disabled, applying for an invalid pension shortly after returning to home in Tioga County, PA. He could take solace in a new wife, at least. In October he married Sarah Smith and together they would produce eight children. Despite his limitations, Reese and his wife seem to have lived happily ever after and even died in the same year – 1911. In many ways, William Reese was a lucky man. He survived one of the bloodiest fights of the war. He belonged to a regiment that was mauled, an army corps that was gutted of officers, and took part in a battle that claimed over 50,000 casualties. Yes, his leg was shattered, but that meant that the fighting was over for him. A return to combat would have meant being with the Army of the Potomac after Gen. Grant arrived and the war of attrition was persecuted without mercy. As I uncovered my great grandfather’s story, The Battle of Gettysburg loomed larger and larger in my mind. It was no longer an abstract matter. It was personal – deeply personal. I needed to return to Gettysburg, not to climb Little Round Top or to cross the field of Pickett’s Charge. I needed to see his name in bronze on that great memorial to valor and Pennsylvania-style courage. Virtually anyone that has visited the battlefield in Gettysburg has seen the Pennsylvania monument. You can’t miss it. It looms over the center of the Union line, by far the biggest monument on the field. According to the National Parks Service, from its base to the tip of the sword of Winged Victory, the monument stands 110 feet high. Largely made of granite, the monument features bronze plaques on the base on all four sides – listing the names of over 30,000 Pennsylvanians who fought at Gettysburg. Although I had visited Gettysburg many times and had been in and around the PA monument before, knowledge that my great grandfather’s name was there in bronze (and had been since 1910) turned my next visit into a kind of pilgrimage. Maybe it was just a matter of pride that drove me to see his name on the monument. It is hard to explain. Certainly I could point to the name as proof that I had an ancestor that fought there (but it’s not like my family tree is there to confirm it). I did not have the same feeling about visiting his grave. I mean I did want to see the grave and felt a sense of kinship in going, but this was different. Here at Gettysburg, recorded in bronze, was an indelible mark whereby an ancestor was linked to a major national historic event. In this case an event that turned the tide of war, helping to secure the future of the republic. It is awe-inspiring. Finding the name was not difficult. The Pennsylvania regiments were listed atop the rosters on the bronze plaques. It was a matter of first finding his company, A, and then reading down the roster…There it was – William B. Reese. I ran my fingers over his name and have to admit to goose bumps and a few tears. Gettysburg would never be the same for me. 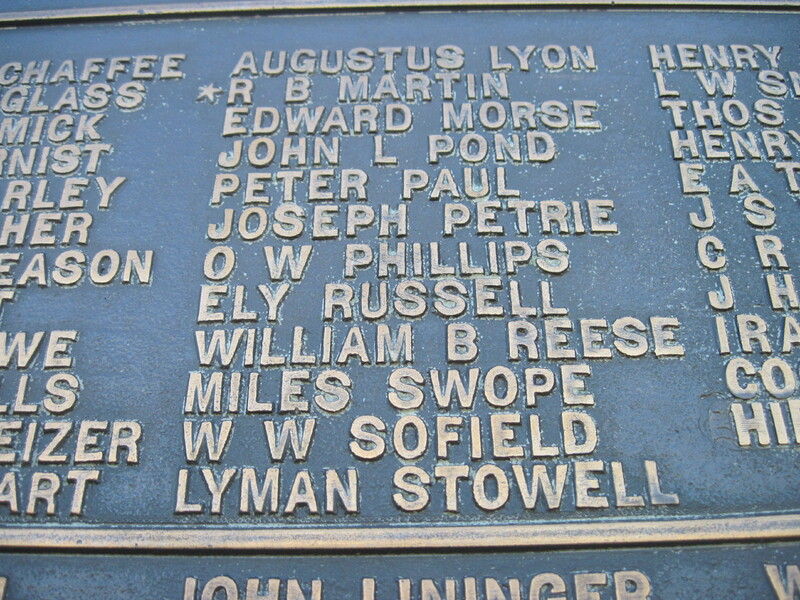 William Reese’s name on the Pennsylvania monument. 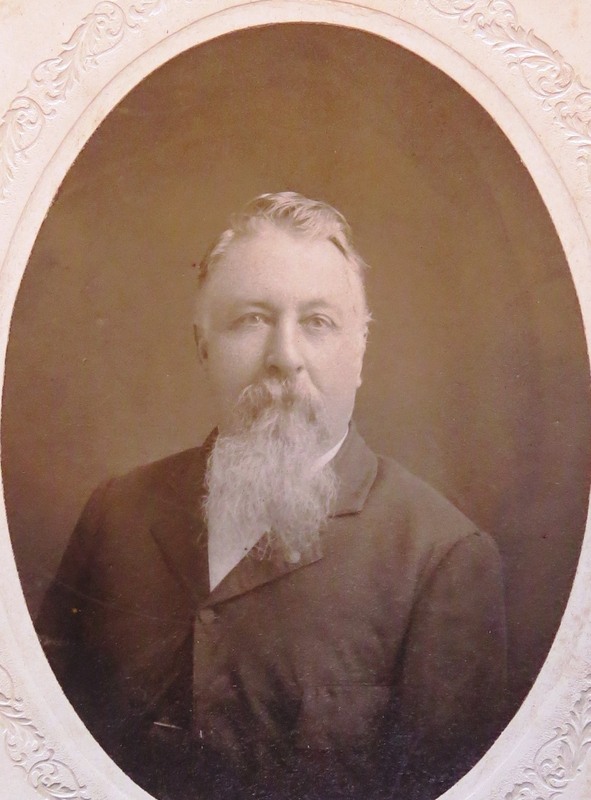 Richard E. Matthews. 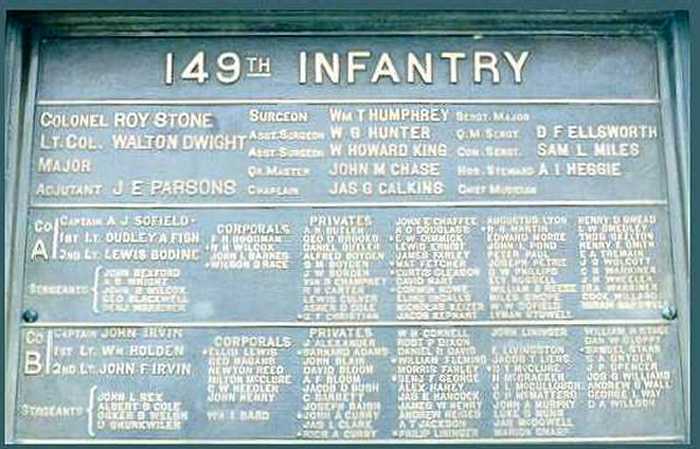 The 149th Pennsylvania Volunteer Infantry Union in the Civil War. Jefferson: McFarland and Company, 1994. This entry was posted in Armies, Battlefields & Historic Places, Battles, Campaigns, Civil War Events, Common Soldier, Memory, Monuments, Personalities and tagged 149th Pennsylvania, Battle of Gettysburg, Elmira, Pennsylvania Bucktails, Robert E. Lee, Veteran Reserve Corps, William B. Reese. Bookmark the permalink. Thanks for sharing this–very poignant especially for others with ancestors at Gettysburg.